TechTalks.ph facilitates innovation in the tech space. One such proof is its venture into corporate-startup engagement. 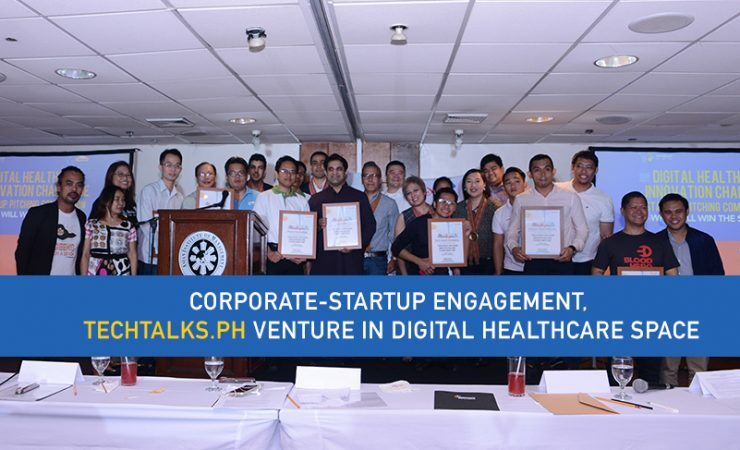 In recent months, TechTalks.ph assisted a global pharmaceutical company in its search for innovative digital healthcare solutions. Takeda Pharmaceuticals International and Takeda Healthcare Philippines, Inc. - the pharmaceutical company behind this groundbreaking venture was more than pleased with the results. The result of the pitching competition speaks for itself. Thus, a bold invitation to the healthcare sector to involve themselves in patient-centric initiatives. “It’s been happening in Europe and the US where big companies work with nonconventional startups. "This is the first time I’m seeing this in the Philippines,” said Jay Fajardo - one of the judges and Chief Technology Officer of Medifi , ProudCloud CEO and Co-Founder, and LaunchGarage CEO and Founder. Dr. Iris Thiele Isip-Tan of the University of the Philippines College of Medicine added, "the First World can also learn from these new innovative low-cost solutions that are being developed here." “We can solve the same problems in a cheaper and more innovative way,” she said. The Takeda Digital Healthcare Innovation Challenge (DHIC) panel of judges was composed of Gabriel Georgy of Takeda Healthcare Philippines, Inc., Jay Fajardo, Dr. Gia Sison who is the Global Telehealth Inc. Chief Medical Officer; Dr. Iris Thiele Isip-Tan of UP; and mClinica CEO and Founder Farouk Meralli. The 10 finalists were chosen from dozens of applicants that submitted their entries last May 10 to June 27, 2016. The entries include mobile and web solutions: from electronic medical records, to early cancer detection and diagnosis, telemedicine, wellness platform, e-prescription, and blood donation platforms. “The time we’re in is exciting, with the opportunity to make a great leap forward. Digital innovation in healthcare is a relatively new area. We have no legacy systems encumbering us so we can develop digital solutions fairly fast,” said Farouk Meralli. The Finder was the cream of the crop of the DHIC. It is a cloud-based Electronic Medical Record solution that can catch cancer red flags in a basic patient examination and forward them to doctor specialists. “Our app seeks to address the lack of oncologists or cancer specialists in the Philippines and the limited access especially in the provinces. Usually, medical diagnoses are not seen at all by proper specialists even if they are available,” said Ascendant Technologies President Serge Arroyo. Ascendant took home the US$10,000 cash prize. The nine other finalists were Blood Hero (PH) - a web and mobile app for blood donation; CarinMED (Malaysia) - an electronic medical records mobile app; docHERs (US) - a digital health platform; Handy Pharmacy Onco (Thailand) -a health consulting app; MedRx (PH) - an oncology ecosystem digital platform; Hybrid Fusion FISH™ (USA), - cancer diagnostics web app; KnowCo (PH) - a cancer information mobile app; TamangAlaga (PH) - a medical records and laboratory result management system; and Renal Tracker - a web-based cancer care platform. “Filipino patients are becoming open to digital innovation. They are going beyond the typical uses of social media and technology towards maximizing it for healthcare. I hope someday these innovative solutions would become the Pokemon Go of the health industry,” said Dr. Sison. So what does the future hold for the tech & innovation industry working with global corporate brands? And where does the TechTalks.ph brand of passion and ecosystem building fit in these? If you are a corporate brand looking to tap into tech startups in impacting the world. Or if you are a tech startup looking for a platform to engage with these corporate brands. TechTalks.ph has the right platform for you.